Tristan: "Is this your little three-ring circus, then? Or is there another ringmaster lurking in the shadows somewhere?" Chris: "That's a bit melodramatic, don't you think? Tonight is my show; that's all you need to know right now." 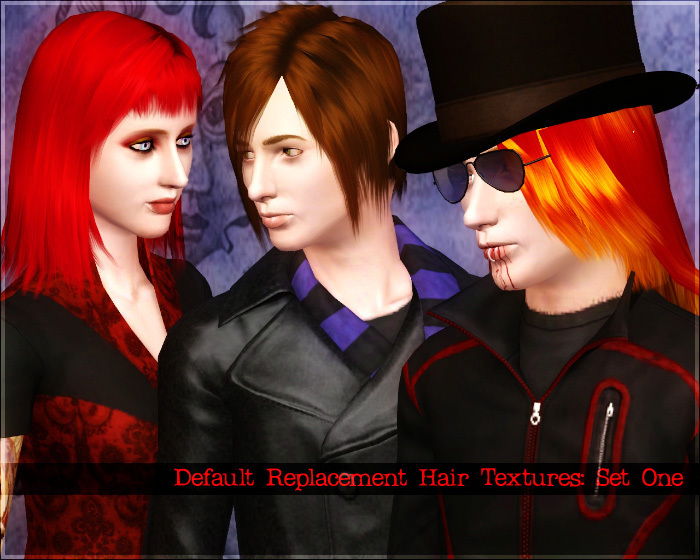 Even more more default replacement hair textures. This set has four female and two male styles. Do whatever you want with these, but keep it off paysites and don't claim the work as your own. The rushing in of ghosts and shards of disbelief rammed into my head. The way I break the mirrors now. 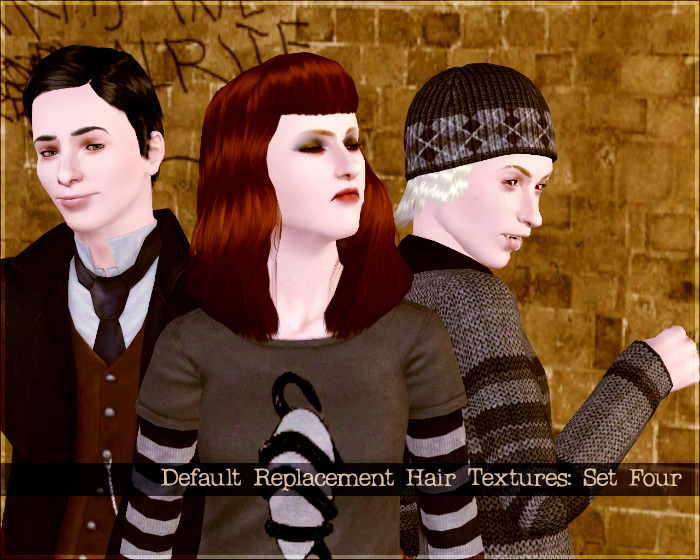 More default replacement hair textures. This set has four male and two female styles. I'd originally done a couple other female styles, but once I got them in game, they looked a little silly so I'll be fixing those up and releasing them later. Do whatever you want with these, but keep it off paysites and don't claim the work as your own. You look at me once, you look at me twice, you look at me again there's gonna be a fight. 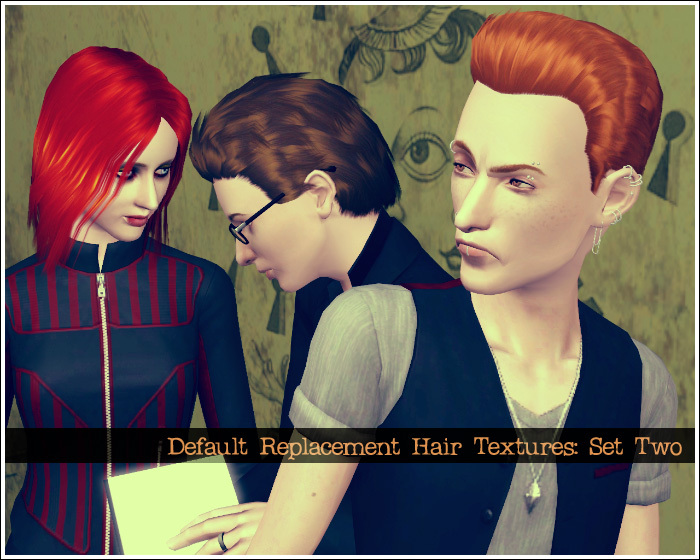 You know, most of the default hair meshes that came with TS3 aren't really all that bad. I decided that I really love the hair texture I came up with, so I thought I'd start working it onto the base game meshes that are more or less just taking up space for me at this point. I wasn't really sure how to get previews of these, but trust me that they really do look good in all natural colors. I've done four male and two female hairs so far, and do have plans to tackle several more before all is said and done. Suggestions of what you'd like to see retextured are appreciated, though no promises are made that I'll actually get around to fixing them up. 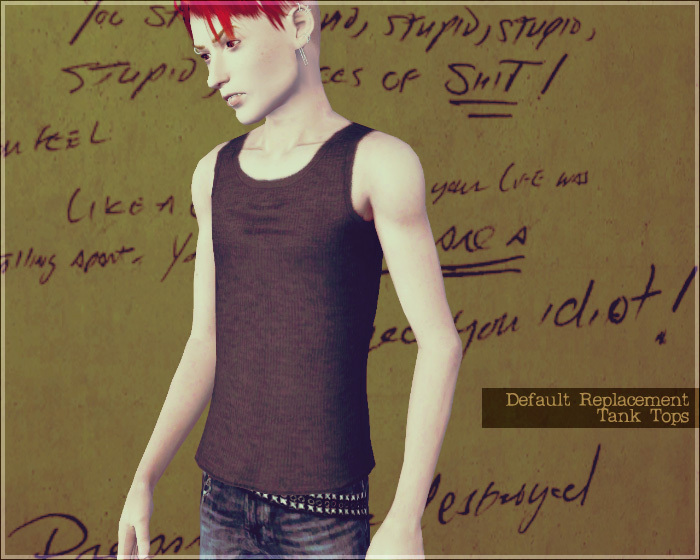 I did an alpha edit of the male 'emo' hair, and have included that as a bonus of sorts. I have a thing for partially shaved hairstyles, ok?! Do whatever you want with these, but keep it off paysites and don't claim the work as your own. Our valued destiny comes to nothing. I can't tell you where we're going; I guess there's just no way of knowing. 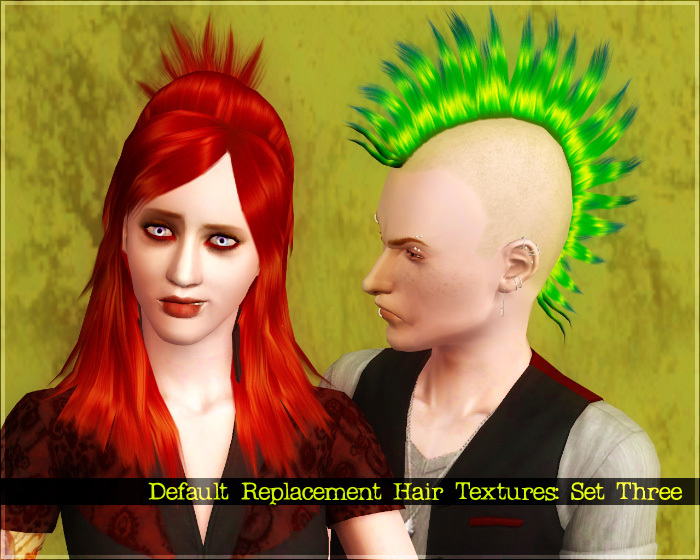 When TS3 was first released, I messed around with one of the hairs just to see how things worked. 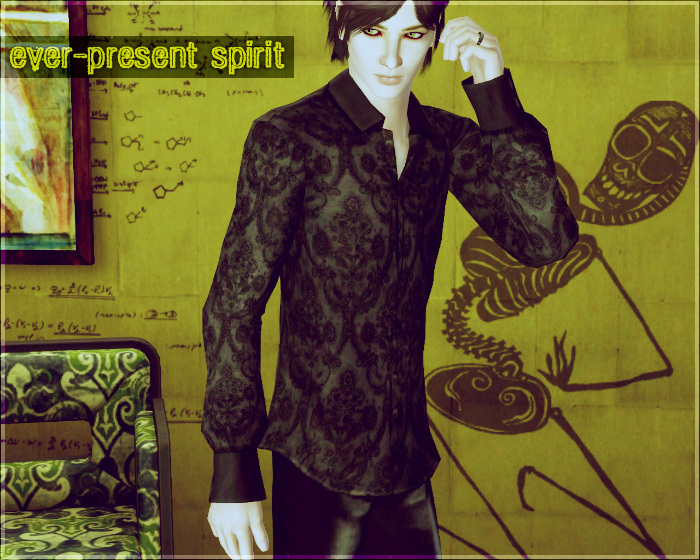 Back then, it was a default replacement and used the game's textures, and was generally just very experimental. I spent some time last week getting it fixed up with a new texture and a LOD 1 and 2 that actually match LOD 0, and now I'm releasing it into the wild. Fly free, little hair! Fly free! Er... anyway... it's available for Teen-Elder males, and is a stand-alone mesh. Do whatever you want, just keep it off paysites and don't claim you made it. 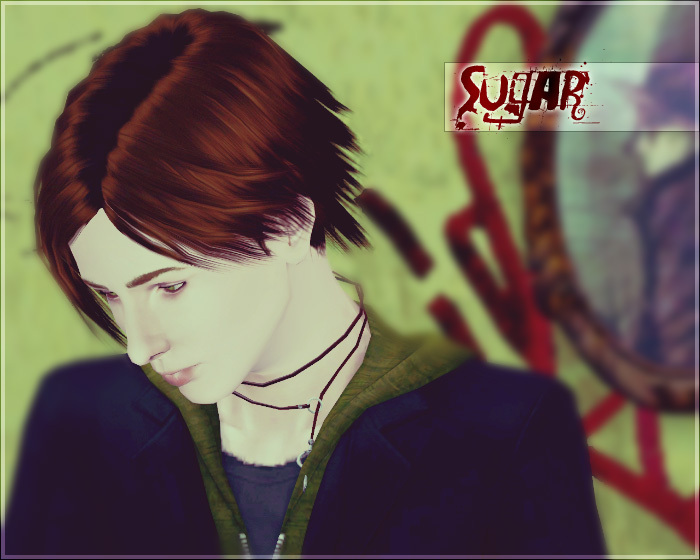 Textures were originally by Sims2Heaven, but heavily edited by me. Don't say morning's come, don't say it's up to me. 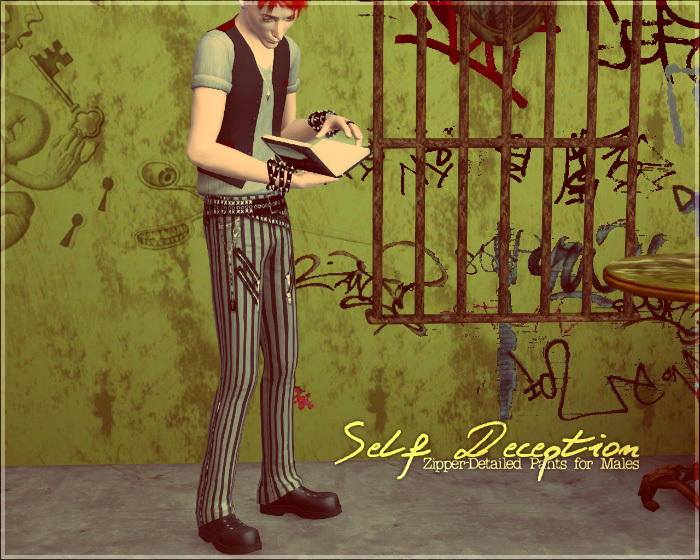 I was staring blankly at a bunch of the CC I'd made for TS2 when I came across some plaid pants with zippers on them. 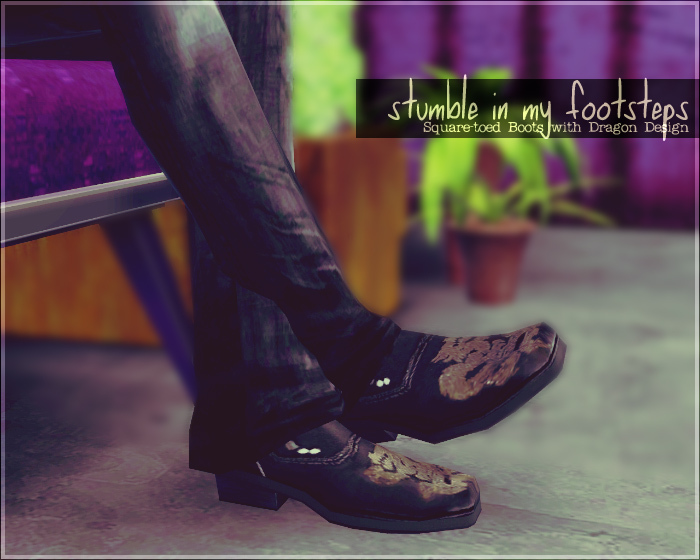 I really liked them, so I decided to make a version for TS3. Yes, I realize my preview pictures use a striped pattern on them instead of plaid. These are for Teen-Adult (maybe elder? I can never remember if I check that box or not no, not for elders), are available for Everyday, Formal, and Career, and have four preset styles. These use base-game meshes and my textures. Do whatever you want, but no paysites and no pretending you made them. Life turned to night as you're asleep, blood flowing down, is this a dream? This page was loaded Jun 5th 2010, 5:49 am GMT.